Air conditioner motor applications include the extensive use of motors in fans, pumps and compressors. Without any one of the motors working properly, the entire system may be down. Hence understanding the basics of motors such as the power supply requirements, FLA, LRA, SFA, classification of the insulation of the motor windings, mounting, bearings and drive mechanism are essential to service the motors. Take note that not all motors can be serviced as some motors need to be replaced with the exact motors to ensure proper operation. In cases where the motor had been phased out, an equivalent motor recommended by the manufacturer is the best solution. A lot of information can be obtained by just checking the nameplate of the motor that you are servicing. Model number of the motor is useful when you need to refer to the characteristics of the motor and when ordering a replacement parts or new motor. Power supply frequency is crucial to the operation of the motor. The frequency is either 50 Hz or 60 Hz. In the United States, the frequency is 60 Hz. If the power supply frequency is 60 Hz, make sure the motor is rated at 60 Hz or else the speed of the motor may be different from its rated speed. Single or 3 phase motor is also specify on the nameplate. Make sure the correct phase is connected to the motor. RPM is the revolution per minute of the motor when running at full load. Operation voltage of the motor is specified here including the tolerance. If the input supply to the motor is too high, it will cause the lifetime of the motor to drop as local hot spot on the windings may occur. Eventually the motor will overheat and burn. If the supply voltage is lower than the lowest operation voltage, the current drawn will increase causing it to overheat. This condition also cause the lifetime of the motor to drop. Current capacity of the motor will specify the FLA and LRA. The FLA or full-load amperage is the current drawn by the motor when running at full load. For example, a 2HP motor may draw a current of 24A at 120V AC and 12A at 230V AC in a single-phase system. The LRA or locked-rotor amperage is the current drawn when the motor is starting and the rotor has yet to turn. This current is usually 5-7 times higher than the FLA.
Service factor amperage or SFA may be printed on the plate or in the data sheet of the motor. This specify the reserve horsepower that enables it to operate above the nameplate horsepower without causing damage to the motor. However, the lifetime of the motor will be reduced compared to if it is operated at full load. 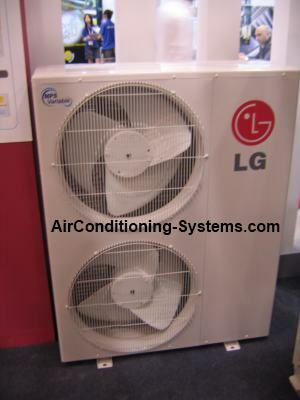 A typical ductless split unit uses an outdoor unit that consist of fan motors and compressor motor. The motors are divided into different insulation type based on the ability of the windings to withstand the ambient and temperature rise during operation. The windings of a motor are insulated from each other through the use of insulation. The insulation is needed or else the windings will short circuit causing the motor to fail. Designers will have to determine the ambient temperature and the temperature rise when choosing a suitable motor when choosing a suitable motor. The quality of the insulation will determine the motor's ability to withstand the temperature rise during operation. Here are the typical insulation class of motors. If you are looking at replacing the motor, check the class of the motor to be replaced and make sure you get one that is equivalent or higher insulation class. The two commonly used bearings in air conditioner motors are the sleeve bearing and ball bearing. The sleeve bearing is quieter in operation but is only able to drive lighter load. It has oil lubrication between the bearing and the shaft of the motor. Sleeve bearing is suitable to be used indoor or in location where noise has to be low. Ball bearing motors are noisy in nature but are able to drive high load in air conditioner motor applications such as pumps and big fans. They are usually installed in a location far away from the space to be conditioned to prevent disturbance to the occupants of the building. The lubricant used is grease and can usually last many years as there are reservoirs of grease inside the bearing.